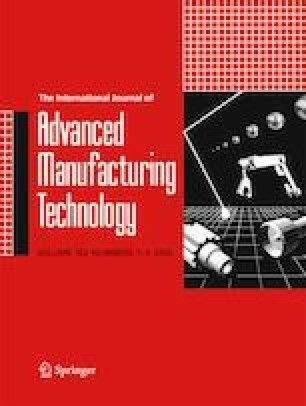 Titanium alloys are regarded as difficult-to-cut materials because of their low thermal conductivity at elevated temperature; elastic recovery of machined surface near the clearance face of cutting tool in single-point diamond turning (SPDT) is unavoidable, causing an extensive tool tip vibration. The tool tip vibrates at a high frequency with small amplitudes in SPDT, resulting of poor surface integrity. Focusing on the problematic tool tip vibration occurred in SPDT, in this paper, the preliminary work was conducted on investigating the influences of eddy current damping effect on the tool tip vibration in SPDT of titanium alloys, showing the reduction of the tool tip vibration. In the experiments, titanium alloys were rotated in between of two permanent magnets and suffered from an eddy current damping effect. The experimental results showed that tool marks caused by the small tool movements in the tool tip vibration were highly reduced, resulting in improvements of surface roughness and surface profile. Moreover, because of the dissipation of kinetic energy of tool tip vibration by the additional eddy current damping factor, the characteristic peak ratio (CPR) decreased too, which it accurately predicted that surface roughness of machined surface decreased with the CPR increase and magnetic field intensity increase. The proposed study provides an effective machining technology to reduce the unsolvable tool tip vibration in SPDT by using an eddy current damping effect. The work described in this paper was supported by General Research Fund of University Grant Committee of Hong Kong Special Administrative Region (Project Code POLYU152125/18E) and the National Natural Science Foundation of China (51675455).